Scientists and the public usually rejoice when a new species is discovered. 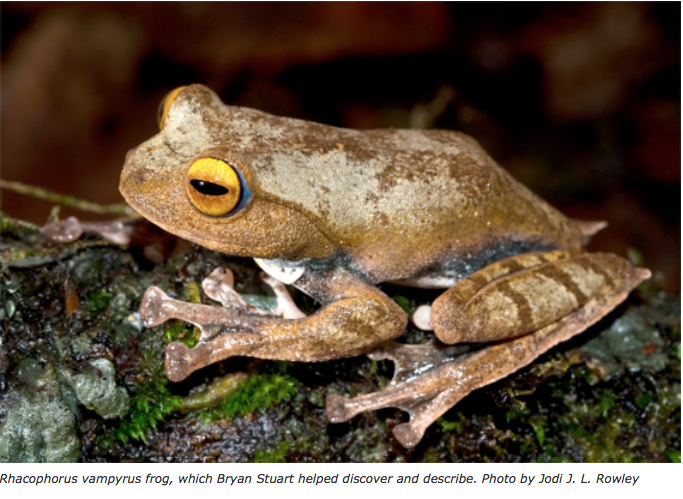 But biologist Bryan Stuart has learned the hard way that the discovery of new species, especially when that species is commercially valuable, has a dark side-one that could potentially wipe out the new species before protections can be put in place. Stuart has discovered 27 species unknown previously to scientists - so far. 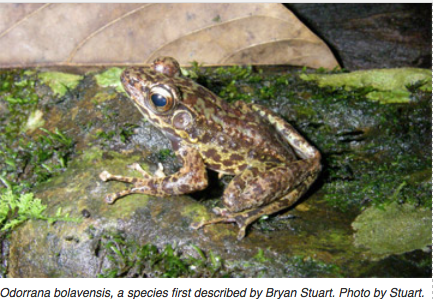 That includes 22 species of frogs, three types of snakes, and two salamanders. His experience with one of these, a warty salamander from Laos with striking markings (Paramesotriton laoensis), opened his eyes to a dark side of scientific discovery: commercial overexploitation before protections are in place. Shortly after Stuart described the previously unknown species Paramesotriton laoensis in a scientific paper published in 2002, commercial dealers began collecting this Lao newt for sale into the pet trade. 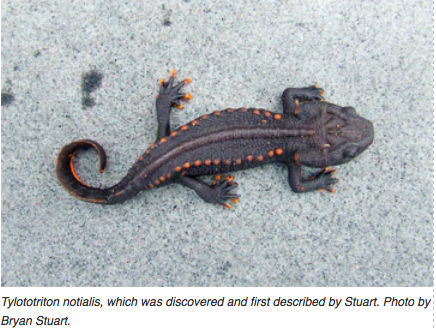 In essence, the dealers used Stuart's geographic description in the paper as a “roadmap” to find the rare newt. This situation is not unique. It's also happened with a turtle (Chelodina mccordi) from the small Indonesian island of Roti, which was so heavily hunted that today it is nearly extinct in the wild. Similarly, a rare gecko (Goniurosaurus luii) from southeastern China was extirpated from its locality as prices in importing countries soared to highs of $1,500 to $2,000 each. It's a dual dilemma. On the one hand, publishing scientific descriptions of new species may inadvertently facilitate their extinctions for commercially valuable species. Yet on the other hand, the conservation benefits of describing the new species can outweigh this potential risk. To reduce the potential tragedy, Stuart recommends that taxonomists work closely with relevant governmental agencies to coordinate publication of the description with legislation or management plans that can thwart overexploitation of the new species. Indeed, he and his students have worked tirelessly in this regard and, in August 2008, Laos' Department of Forestry protected the Lao newt from commercial trade. Now, the remaining question is one of enforcement. 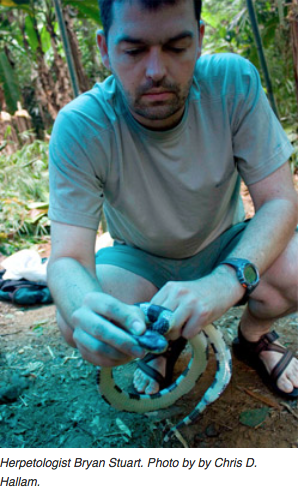 Bryan Stuart is the curator of amphibians and reptiles at the North Carolina Museum of Natural Sciences. He received his Bachelor of Science in biology from Cornell University, a Master of Science in zoology from North Carolina State University, and a Ph.D. in biology from the University of Illinois. His research focuses on amphibians and reptiles of the Old World tropics, especially Southeast Asia, where he has maintained an active field program for the past decade. He has particular interest in using molecular tools to define species boundaries and unravel their evolutionary histories. Laurel Neme: Of all the species you've discovered and described, I know that the discovery of the salamander in Laos (the Lao newt, Paramesotriton laoensis) haunts you. Bryan Stuart: That's a very interesting story. That is probably, of all the species that I have discovered and described, the one that really stays with me. There was a very unexpected turn of events related to that description. When I started working in Laos in the late 1990s, there were no known species of salamanders from the country. Salamanders are essentially a temperate group of animals, and they just marginally get into the northern parts of Southeast Asia. You find salamanders in northern Burma, northern Thailand, northern Vietnam, and southern China. We expected that they occurred in northern Laos, but none had been previously documented in that country. Then, in 1999, one of my Lao colleagues found the first examples of a salamander up in the northern part of the country. The actual discovery was rather unusual. He had gone home to a rural part of northern Laos for a wedding, and when he returned to the capital city, he brought back with him a few examples of a salamander that had been put into the local alcohol for medicinal purposes. The idea was you put this animal that has very toxic skin secretions into the alcohol, and then you drink the alcohol at a party, such as this wedding, and there's some perceived health benefits from doing so. In any case, it is really this sort of unusual circumstance where his attendance at this wedding resulted in bringing these salamanders to my attention. Laurel Neme: What does the salamander look like? Bryan Stuart: They are a remarkable species. They resemble in their morphology no other known salamander. They are large, have very warty skin, and are brightly colored on their back and belly. Their back has these almost yellowish stripes, and their belly has these bright orange spots. Laurel Neme: When you first saw these salamanders in the alcohol, what made you think that it was different? Did the alcohol change its color? Bryan Stuart: Alcohol preservation does over time dilute the colors; the colors do leach out of the specimen. But these were freshly collected, I think, and the colors were still apparent for these animals that had been preserved for medicinal consumption. They were immediately recognizable as something different. Their skin texture, their size, and the coloration were just totally unique. Laurel Neme: After seeing this first specimen, did you go into the forest to find more? Bryan Stuart: Unfortunately, the area where they came from, at the time, was a very sensitive area to go to in Laos. There were some security concerns there. It took some time but finally things calmed down and we had a very, very brief opportunity for us to go into that area to find the species in the wild, in a stream. As a result of that work, we were able to describe this thing a few years later in 2002, in a formal description that came out in a scientific journal called “the Journal of Herpetology.” In that journal we named it a new species and we gave it the scientific name “laoensis” (Paramesotriton laoensis), which means “found in Laos.” The reason [for that name] was that we believed at the time that the species occurred only in Laos, and therefore we thought it was an appropriate name. Laurel Neme: What happened after publication of the scientific description for Paramesotriton laoensis? Bryan Stuart: Something unusual happened. We published that description, and then I set out on the business of working on other projects. What happened then was something very unexpected. Because this species of salamander was very, very poorly known - it was essentially known only from the two localities that were presented in its original description, and just based on very, very few animals - and it was such a large and colorful and warty animal that was so unusual, a demand was created by people who collect amphibians and reptiles for the pet trade. There is a demand to have rare species in private hobbyist collections. What I never anticipated would happen is that commercial collectors used the scientific description of this species, used the actual scientific journal as a sort of road map, for how to go and find it and commercially exploit it for profit. What happened was, both almost simultaneously, some commercial collectors from Germany and commercial collectors from Japan converged on the small geographic area in Laos where it occurred and, illegally, without permission, started collecting these animals and paying local people to collect them. Ultimately, very large numbers of these animals were illegally taken out of Laos, and sold for a very high value in Japan and Europe. Laurel Neme: How much were they selling for? And how many were collected? Bryan Stuart: The price varies, but essentially local people were paid approximately ten to twenty U.S. cents per individual [salamander], and then they're selling back in Europe or Japan for the equivalent of over 200 Euros a piece; so, a very striking price difference. But it became a real worry because the salamander was only known from these two little streams, and commercial collectors had converged on those two small areas where the species was known to commercially exploit it for profit. There was some real worry that in fact this species might be threatened with extinction from its practice. Laurel Neme: What did you do when you found this out? Bryan Stuart: I did two things, almost simultaneously. 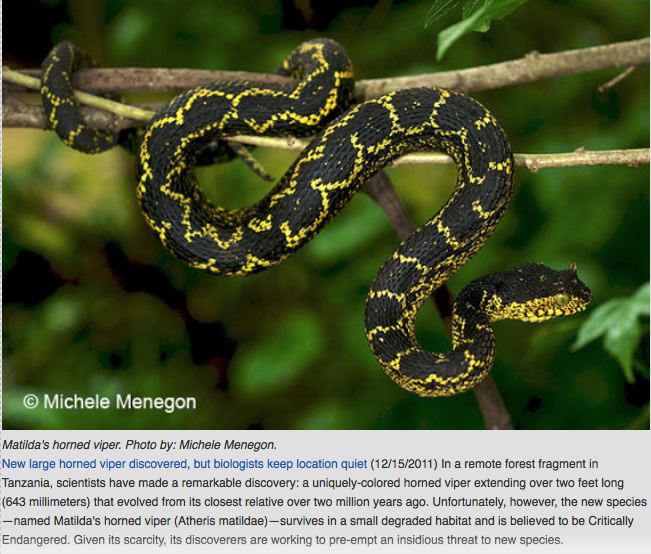 The first was I teamed up with two other herpetologists who had very similar things happen to them and we published a letter to the editor in the journal of Science. During the course of their work in doing biodiversity science, in describing species, so that ultimately these species can be recognized and conserved, they had the same thing happen where, unexpectedly, commercial collectors used those descriptions to exploit the species for commercial profit, because these were rare, newly known species. In addition to the Lao newts, we had an example of a gecko from Southern China and a turtle that was known only from a very small island in Indonesia. Both of these commanded very high dollar in the pet trade given their rarity and their beauty. At the same time, it was very clear to me that we needed more information on the status of this newt in Laos. By this time, I had started working with my colleagues at the National University of Laos, in this cooperative program with the Wildlife Conservation Society, and it was very obvious to me that this species of newt is known only from Laos. [I thought to myself] why should it be that I am the world's expert on this species when, in fact, its entire known range occurs within the country of Laos. Why not have a Lao person be the world's expert on that species? So, I recruited a student who was interested in taking on the project. Her name was Somphouthone Phimmachak, and she was one of the first students to enter the new Masters of Science program at the National University of Laos. Her background was in fisheries science, and she really knew very little about amphibians when she and I started working together. But she turned out to be extremely competent, extremely bright, and very quickly amassed tremendous information on amphibians of her country, especially salamanders. 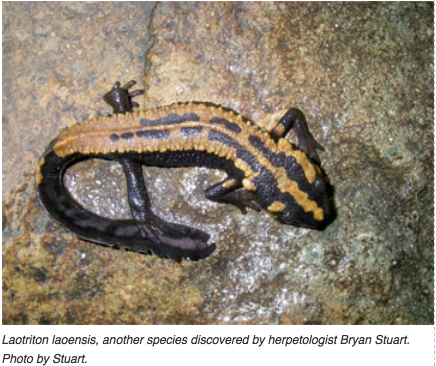 She took on the Lao newt to be the focal species for her Master's thesis. 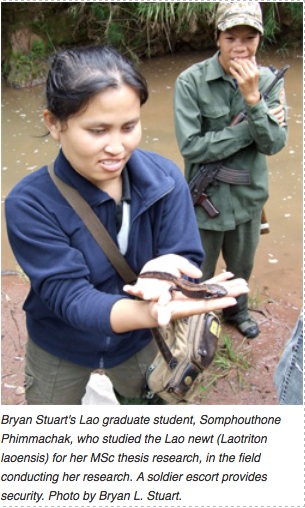 Her thesis, which she finished in 2010, became the first Masters of Science degree ever awarded from her country, and she is one of Laos' first national herpetologists. Laurel Neme: What is she doing now? Bryan Stuart: She's currently enrolled in a PhD. Program in Bangkok, Thailand where I continue to co-supervise her, and she continues to work on salamanders of Laos, although a different group than the Lao newt. Laurel Neme: What was the impact of her research on the Lao newt? Bryan Stuart: In the course of her thesis work she documented the approximate extent of the geographic range of this Lao newt. She confirmed that this species occurs only in very high elevation, in the headwaters of streams, in a very small geographic area in northern Laos, an area that is essentially called the Xiangkhoang Plateau. So, she confirmed our suspicion that, indeed, it occurs not only just within Laos but within a very small area in Laos. She learned that local people have historically for a very, very long time collected the animals in very small numbers for in some cases food, in other cases medicinal purposes, such as the wedding alcohol example I gave earlier, but that there was no real significant commercial trade in the species, until just a few years ago when foreign commercial collectors for the pet trade visited Laos and set up these trade networks to collect it, illegally export it, and sell it in Japan and the West for profit for the pet trade. And since those activities started, there is now a very large network for the species, and it is very heavily harvested. What's unfortunate is the newt occurs not only in a small geographic area but, within that small geographic area, it occurs only in within certain streams, at the very high elevation portions of those streams. [Plus,] it's a species that you can see very easily [both] during the day in these small stream pools and also at night. They tend not to be shy because they have very toxic skin secretions. They're very comfortable walking about the bottoms of these stream pools during the day and that makes them very readily harvested by people. Laurel Neme: How has the ease of harvesting these salamanders affected their populations? Bryan Stuart: In response to these demands that were set up by foreign collectors, the animal can be collected in very high numbers, very quickly. For example, villagers would often report to us selling this very rare, locally endemic Lao newt to visiting traders not by the number of individual salamanders, but by the kilogram-representing enormous numbers of these salamanders. It's really quite tragic what happened. Laurel Neme: Is that the end of the story? Is the newt still being traded? Bryan Stuart: There's sort of a happy end to the story. 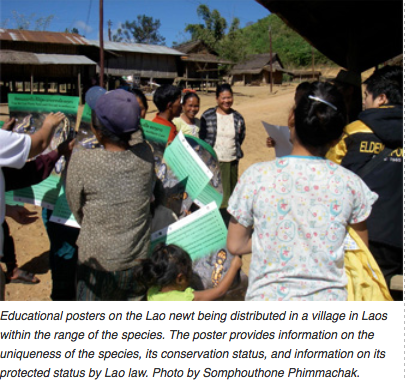 As a result of Somphouthone Phimmachak's thesis work on documenting the distribution, the natural history, and the conservation of the species, her efforts led to the Lao newt being formally listed in 2008 as a Nationally Protected Species in Laos. That status, called a Category 1 species, now makes it illegal to conduct any commercial trade in the species. So, thanks to her efforts, that species is now, at least by law, protected from those activities. This [scientific species] description has taken me to places where I never expected it would. What started out as this very straightforward species description, then became quite a shocking tale of me inadvertently, unexpectedly, subjecting the species to extinction because of demand by people who were motivated by greed and profit. Then, ultimately, getting the Lao on board with it, and passing this ownership of the project to them, and helping a Lao biologist become the world's expert in a species that is known only from their country. Then they, in turn, push forward the protection of the species in their country. That, I think, is the way I would hope to always work in the future: working very carefully with local scientists and students, trying to understand the biodiversity collaboratively, and ultimately making sure that the responsibility of what to do about that biodiversity really falls on my in-country partners. 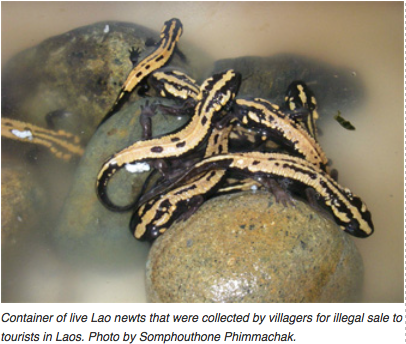 This example of the Lao newt shows that ultimately, in terms of the conservation of these species, that kind of collaborative activity is really critical. Laurel Neme: What can you do to prevent this situation (overexploitation of newly discovered species) in the future? Could you delay the scientific description until protections were in place? Or would that also be counterproductive because a description, that tells what they are and where they occur, is necessary for conservation? Bryan Stuart: That is indeed one of the solutions that was put forward from this problem that was raised - for the descriptions of species that we have advanced knowledge of that may be commercially valuable, perhaps we should coincide those descriptions with legislation that will protect them from overexploitation. It's difficult to come up with very many other solutions. In some cases, I know that some other museum curators, such as myself, while we are motivated by trying to make all the information from the collections that we are responsible for as freely available to the public as we can, we do try to keep in mind stories like the one I've just reported, where there are those few bad apples out there, people who are looking to obtain those data not for scientific activities but rather for personal profit. There are commercially valuable species in museum collections, and in some cases releasing the details on where they came from may inadvertently lead to their exploitation, in the manner like I just described. Now that this is becoming more and more of an issue with other examples around the world, many museum curators, for example, restrict providing detailed locality information on certain commercially valuable and vulnerable species. But it's not an easy problem because at the end of the day, just as you hinted, if we're really going to conserve these things we must know what they are and where they occur. Keeping those descriptions and their localities a secret ultimately does almost nothing both in terms of advancing science and in terms of conserving these species. It's a big problem, and I think it's a problem that requires more discussion, within the community. Laurel Neme: What can people or consumers do to prevent this problem? Bryan Stuart: I hope that this issue raises some awareness when people purchase amphibians and reptiles as pets. The pet trade is not a small industry; it's a very large industry. And the keeping of amphibians and reptiles as pets is now a major industry. Fortunately, there are many species of amphibians and reptiles, especially reptiles, that have been bred in captivity for many, many generations, and are widely kept as popular pet. In fact, many of these snakes in particular, come in a wide variety of artificially produced color morphs, and so on. I think it's great when people are maintaining these captive-born animals as pets, provided they're responsible enough to not release them into the wild, in that they often will generate enthusiasm for people to learn about amphibians and reptiles, and enthusiasm about keeping these kinds of animals alive in the world rather than persecuting them - because snakes and other reptiles are heavily persecuted by people who misunderstand them. But, on the other hand, there are a lot of species in the pet trade that are not captive-bred but rather wild-caught animals. The trade in wild-caught animals for the pet trade is very, very large. I think some consumer awareness is badly needed. Often people will go down to a pet store and purchase a beautiful amphibian or reptile without considering its source. Oftentimes, those are rare species that were indeed wild caught, and by purchasing them as pets they're providing a motivation for more of that exploitation. The Lao newt is an extreme example. I hope that it generates some awareness that actually the trade in wild-caught animals for the pet industry can be detrimental.